Okay, so first let me issue a caveat and say that my title is intentionally provocative: I don’t necessarily think research request forms are always a bad idea. There are contexts in which they make sense. But let me give a few reasons why I prefer not to use them in my shop. When someone asks for something, if I understand the context and background of their request I am best positioned to be able to meet their needs. When I know why they’re asking for what they’re requesting, I will have a much better sense of what I really need to do to help them. For example, there may be a couple of different reasons why a gift officer might need a rating assigned to a prospect: they might be trying to advise a volunteer on how to steer the gift conversation with that prospect; or they might be trying to prioritize some leads referred to them. In the latter case, I would likely take a very quick, “chainsaw cut” approach to estimating capacity. We’re just trying to pit some prospects against one another to see whom we should call first. In the former case, I might spend more time understanding the complete financial picture of the prospect (What visible assets are there? What other obligations and liabilities could this person have? Is it likely that market conditions are impacting this person’s self-perception of their wealth?) The context and motivation behind a request makes a big difference in how I approach the task at hand. Here’s an example: imagine you have three levels of “profiles” that people can request. Only one of these – the “full biographical profile,” which includes everything AND the kitchen sink – contains information about the boards a prospect serves on. So if a gift officer is trying to get a visit with Joe Potentialdonor, and they want to figure out who might know Mr. Potentialdonor, they will request the “full biographical profile” so they can get information about what boards he is on. The researcher spends eight hours putting together the profile, when the gift officer really only needed some information that could have been compiled in 45 minutes. If the gift officer has no form to fill out, she’s free to ask for exactly what she needs: people who might help her reach Mr. Potentialdonor. The gift officer has the great idea to start by looking at people who are on the same boards as Mr. Potentialdonor, and the researcher might have other ideas of who to look for (classmates, co-workers, etc.). In this scenario, the gift officer gets even more of what she really needs, and the researcher spends far less time procuring it for her. If you’re thinking about using a research request form, be sure you consider the trade-offs. They can help streamline the process of asking for standard products, but they strip away some valuable things in the process! Is it worth it? Google search, for better or worse, plays a pretty central role in the Research profession. Lots of people use it; the best researchers know how to get a lot out of it; lots of development staff mistakenly think researchers spend all their time just “googling” things; it’s loved for its power and ease of use and sometimes dissed for its search personalization. When we talk about research, it’s hard to avoid Google. But I came across a quote this morning that suggested an even better way we can harness the power of Google: be more like it. The best prospect research and management shops definitely feature the utility of a really complicated Swiss Army knife. From complex prospect identification tools like statistical modeling analysis to robust prospect management systems that track myriad concurrent activities, to rich, in-depth information development – prospect research departments can do a lot of really cool, really useful things. 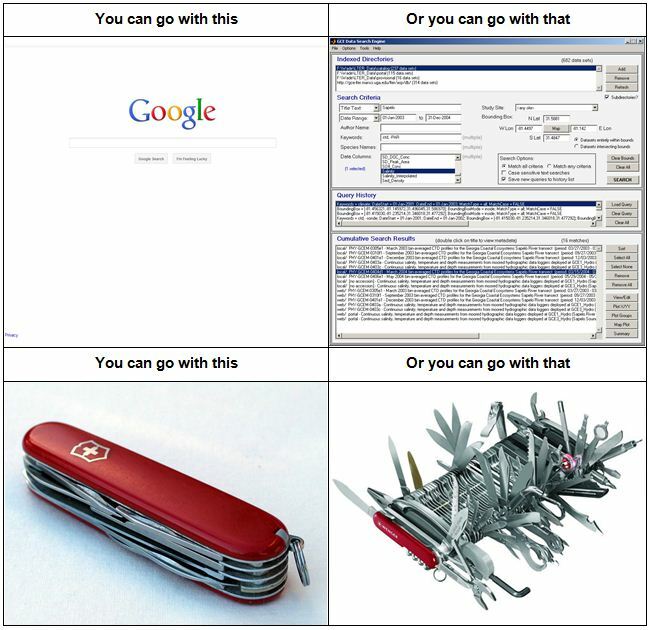 But do we feature the elegance and simplicity of a closed Swiss Army knife or the Google search interface? Do we make it easy and effortless for our “users” to interact with us? I’m not convinced that we do so as much as we should, and that may be an opportunity for improvement. A complaint I’ve heard from frontline fundraising staff (not necessarily at my institution) is that it can be too difficult to interact with a prospect management system – entering contact reports or updating prospect or proposal tracking information is too tricky. And that’s a big turnoff and clear deterrent from use. To some extent, most of us think about this sort of thing frequently, but I imagine by incorporating more thoughtful, elegant design with a focus on simplicity into everything we do, we make the fruits of our labors more accessible and desirable to use. When you’re trying to fill an open position, the way to do it is by finding the best candidate in the applicant pool, and then offering them the position, right? You can go this route, and it’s particularly tempting after you’ve reviewed all of the candidates, phone interviewed many of them, brought several of them in for in-person interviews, and brought a few in for MORE in-person interviews, ALL while trying to keep up with the workload in your short-staffed shop. Problem is, if your top candidate doesn’t cross the Threshold of Hireability, you aren’t doing yourself any favors. Any time I’m deciding whether or not to extend a job offer, the most important question I ask is whether or not the candidate crosses this Threshold. If not, I keep looking. 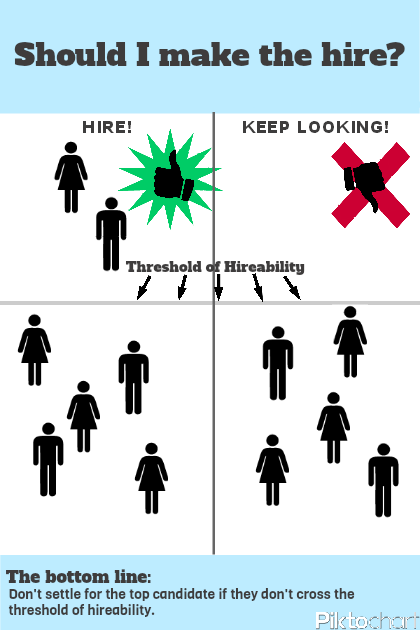 What exactly is the “Threshold of Hireability?” It’s the dividing line that separates the truly hireable candidates from the ones that are just okay. If a candidate doesn’t make it past this line, don’t even consider hiring them, even if you are in a pinch. How do you set your Threshold of Hireability? Ultimately, that is up to you as the person making the hiring decision, but it comes down to this: What are the skills and attributes that are essential for the successful candidate? What are the deal-makers and deal-breakers in terms of what a candidate brings to the table? What qualities does the candidate need to have to be a valuable addition to your team? Consciously defining your Threshold of Hireability — and then thinking about your top candidate(s) in the context of that standard — positions you to make a much better hiring decision than you would if you simply chose the best applicant. There are a number of reasons why you don’t want to make a bad hire, and the Threshold of Hireability is one “tool” that can help keep you from making such a mistake. Never settle for anyone who doesn’t meet the standard you set; and if you find that more than one candidate clearly exceeds the Threshold, wonderful! Your hiring decision just got a whole lot easier! If you get someone who is unqualified to do the work or does not have any drive to do it well, not only will you have to deal with the immediate effects of their sub-par work, you’ll also have to spend more time training the person to do it right; figuring out how to motivate them to do their best work (motivating people should not be a manager’s job, but that’s a topic for another post); checking and double-checking their work more frequently to ensure that it is up to snuff. It can all become a serious time-sink. Every department and organization has a culture and the people within it have a way of working together. If your new hire doesn’t fit well with everyone else and integrate effectively with the generally accepted working styles, others can be rubbed the wrong way by that person, which may slowly chip away at relationships you’ve worked hard to build and maintain. You know that guy who just does C-average work and phones it in all day? Everybody else on your team resents him. And if you’re the person who hired him, folks might not be too thrilled with you now, either. None of this likely makes any of your team members feel great about the workplace in general. Probably the worst part of making a bad hire is the fact that it can be very difficult to remedy. If I don’t like a vendor I’m working with, I don’t have to renew my contract with them. In most personnel situations, I don’t have that option. I will have to go through a termination process or find a way to encourage the person to pursue other career opportunities. The former can be really unpleasant (at best! ), and the latter may be really difficult, particularly if the employee is intent on staying in their current position. If you’re making a hire, take the time to do it right and don’t settle for someone sub-par just because you feel pressured to fill the position. It is much better to suffer through a little extra time being short one person than to suffer through a loooonnnnnggg time dealing with the repercussions of getting the wrong person. These are important things that we might do every single day! (Especially those of us who are managers) So you’d think there would be a lot more emphasis on training and focused improvement on them. Think about it: when someone becomes a prospect researcher, they get training on a range of skills: using special resources; searching the web effectively; analyzing SEC documents; finding and using assessors’ databases; etc. But when was the last time anyone talked about taking time to get training on data visualization? Or doing annual reviews? Or giving presentations? These are the sorts of things that many people just dive in and do, in many cases without taking a lot of time to think seriously about how we do them well (much less getting focused training). I think this needs to change. As professionals, we have an obligation to continue to hone our skills in all areas. And if this general obligation-to-get-better notion doesn’t resonate with you, think about it this way: if you’re the gal (or guy) who is just a little bit better than everyone else at hiring people; at giving feedback; at creating visual aids for presentations; at writing… then you are going to start to stand out and get noticed, in your office, at your organization, and within your field. I’ve been working in organizations for close to a decade now, and one of the things that has continually intrigued me is failure, specifically, how certain things just fail to get done. It’s not that I’ve ever been any place where this is pervasive — I’m certain that it happens at every organization, no matter the size, no matter how effective or efficient the organization is, no matter how great everyone who works there is. Sometimes things don’t get done because people make a conscious decision not to do them. That’s not what I’m talking about here. (Those decisions are actually really good ones to make – they help us keep focused on what is most important!) I’m talking about the things that require completion but for some reason get lost in the shuffle. The person responsible may not correctly and fully understand what they’re supposed to accomplish. If we are not specific about what needs to be done, how do we know when it is complete? For example, if the next step on a documentation project is “Work on text about prospect management documentation,” it’s not clear what exactly would be accomplished. And if a person were being really literal, after “working on it” for five minutes, they could technically say they were done! Instead, a better step might be “Draft definitions for key prospect management terms.” It’s obvious what needs to be done, and it will be pretty clear when it’s complete! Great! We have decided that we are going to do that thing! Of course the problem is, WE do not do things. Individuals do things. If the discussion about a task stops at the “we” level and no individual is assigned to it, it’s entirely possible that everyone at the table will assume that it’s the other guy’s responsibility. Of course areas of responsibility are NOT always clearly defined and universally understood, which is where things start to deteriorate. And even if roles are crystal clear, a next step can (and often does) fit into multiple areas. For these reasons, it’s always smart to explicitly define the “who” part of a next step. If nobody asks that question you can easily end up with a mixed bag of assumptions about when the task will be complete. One person might think it should be done by the end of the week, while the other might think they’ve got a month to take care of it. When that discrepancy is between a manager and her direct report, the conditions are just right for a potentially frustrating situation: if the manager expects the earlier deadline and it is missed, she is upset because things aren’t progressing according to (what she thought was) the plan; the direct report is upset because the “missed” deadline isn’t necessarily his fault! Deadlines also help impose a sense of urgency on a project. If no due dates are defined for each of the steps along the way, things can suddenly grind to a halt. The success or failure of a project can hinge on whether or the right people are paying attention to each of the steps. The simplicity of these components is kind of stunning, so much so that I feel a little silly even writing this post. How hard is it to define who is responsible, for what specific step, by when? How hard is it to circle back and ensure that the task was completed when promised? Apparently it’s all just hard enough, because it’s not uncommon to see these small failures, even when working with excellent people at excellent organizations. Can we get anything done when we fail in any of the areas described above? Sure. People still accomplish a LOT when the who, what, when, or follow-up is missing. But I suspect we can do EVEN MORE if we are more disciplined about our clarity in all these areas. Chris replied to my tweet and asked what I’ve seen work in addressing these issues. The answer to that question deserves more than just 140 characters! (Plus it’s a pretty darn good topic for a blog post.) So I thought I’d touch on it here. I’ve found that there are two key components that go a long way in tackling the researcher-fundraiser disconnect: getting the right people in place, and getting them to do the right things. What are the “things” people need to do? Helen Brown, in her own response to Chris’s post, suggests that communication and relationship building are two of the things that are most critical. She’s absolutely right! But what exactly do we do to make that happen? At my institution, Research staff get face time with gift officers. We have both formal and informal meetings where we talk about the work and we just maintain a positive relationship. Every month, we have a formal “research partner meeting” where the researcher and fundraiser get together to review prospect management reports in preparation for the monthly prospect meeting. They go over outstanding and upcoming solicitations; they review prospect lists; they talk about recent visits; they talk about how they can best help one another. As much as possible, we try to have informal interactions with one another. I encourage my research staff to stop by the fundraisers’ offices from time to time or go have coffee with them. Frankly, I don’t care a whole lot about what happens in these encounters, as long as it’s positive. If the researcher and gift officer spend an hour talking about March Madness, great! They’re building that relationship and increasing the good rapport that helps keep open the lines of productive communication. Of course these “things” that we try to do to foster good relationships between researchers and fundraisers are practically worthless if we don’t have the right people in place to do them. If I’ve got a researcher who is too shy to drop in on gift officers, they can’t have successful informal interactions. If my researcher is generally surly and cantankerous, they’re going to have a hard time building a good relationship with the gift officers. So any time I’m hiring a new researcher, I pay a lot of attention to their personality and general disposition. Are they generally outgoing? Do they seem relatable and easy to get along with? This is probably more important to me than a person’s research experience or capabilities, because I can train most people to do good research. It is far more difficult (maybe even impossible??) to train someone to be pleasant to be around, or not to be shy. If they are internally motivated to reach out to the people they work with and they enjoy doing it, that will be one critical piece I won’t have to worry so much about needing to continually push. Do I feel like I’ve completely solved the problems Chris describes in his post? Nope. (I’ve got one fundraiser, for example, who has said more than once, “I can find plenty of stuff myself on google, but you guys have access to special databases that we don’t.” Sure, it’s true, but it indicates that we haven’t done a good enough job of educating about our capabilities as in-depth information seekers AND as specialized analysts.) But having the right people in place, doing the right things, sure does go a long way in making for a stronger, more productive relationship between Research and frontline fundraisers.